Established by the motor insurance industry in 1969, Thatcham Research helps contain or reduce the cost of motor insurance claims while maintaining safety standards. Thatcham Research was established by the motor insurance industry in 1969, with the specific aim of containing or reducing the cost of motor insurance claims while maintaining safety standards. We remain the UK’s only ‘not for profit’ insurer funded research centre, and hold a unique position thanks to our involvement and engagement with vehicle manufacturers, regulators, law enforcement organisations, automotive bodies and insurers to provide a holistic view of the benefits or shortcomings of vehicle technologies. Our research is at the forefront of vehicle safety, security and repair. Most of our work is funded by a levy on our 24 member insurers. We also generate our own revenue providing a unique range of products and services primarily to the motor repair industry, contributing to an annual turnover of around £15 million. We are also a founder member of the International Council for Automobile Repairs (RCAR) and have been a member of the European New Car Assessment Programme (Euro NCAP) since 2004. Thatcham Research has an increasingly influential role in vehicle safety testing on behalf of the widely respected Euro NCAP (European New Car Assessment Programme). We carry out a range of highly complex crash testing as well as collision avoidance scenarios, and are leading the development and assessment of new testing protocols for the very latest vehicle safety technologies. We play a key role in shaping the designs of new vehicles and the use of materials and technology. Working closely with vehicle manufacturers, we have been able to influence vehicle design concepts both in terms of safety and security and through the provision of fully researched repair methods is seen in many quarters as the driving force behind standards in vehicle repair. Our Automotive Academy provides training and accreditation, both for apprentices at the very start of their career, and for more experienced technicians looking to update and reaffirm their skills. Thatcham Research has been at the forefront of vehicle security since the 1990s when it introduced a security assessment (NVSA) for new vehicles that is applied to the group rating for insurance companies. Since then, we have been working with law enforcement agencies, the automotive industry and insurers to assess potential physical and electronic vulnerabilities within vehicles, and identifying the technology and ways to mitigate theft. Based just outside Newbury in Berkshire, Thatcham Research has grown from small beginnings to an organisation now boasting over 180 staff, a state of the art vehicle research workshop, a Euro NCAP approved Crash Laboratory and a fully equipped automotive academy. 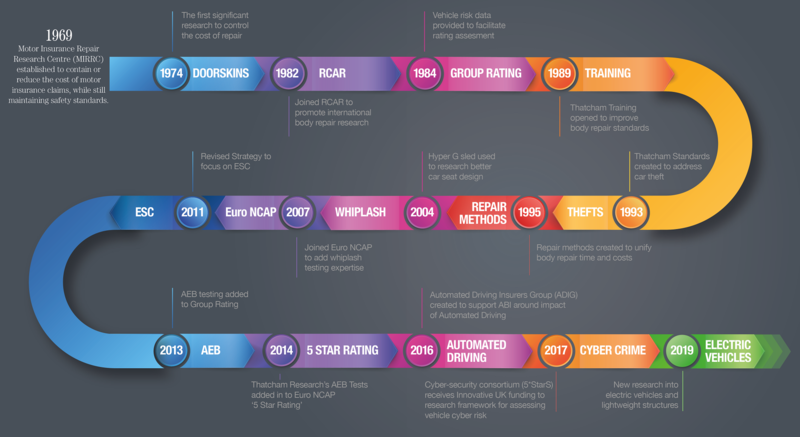 A founder member of the international ‘Research Council for Automobile Repairs’ (RCAR), Thatcham Research have also been a member of the European New Car Assessment Programme (Euro NCAP) since 2004. Enjoying an increasingly global influence in both the insurance and automotive sectors, Thatcham Research are regularly asked to provide their experience and know-how at high profile events and in the media, living up to their reputation as ‘Experts in Safety, Security and Crash Repair’. At the cutting edge of automotive research in the UK, Thatcham Research has a unique role in shaping the design of new vehicles and influencing ever higher standards of safety, security and repairability. With an on-site Crash Laboratory, Repair Technology Centre, Training Academy and Crime Lab, our research expertise is driving some of the very latest automotive developments in technology, materials and standards in this fast moving and highly technical industry. A highly influential member of Euro NCAP – the European consumer champion for car safety – we’re making a real difference to millions of people as we pursue our vision of ‘Safer Cars, Fewer Crashes’. You can view all of our current vacancies on our careers site. Thatcham Research employs over 180 staff covering research and data analysis across vehicle safety, repair and security. The facilities include a state of the art vehicle research workshop, a Euro NCAP approved Test Track and Crash Laboratory, as well as two fully equipped Automotive Academies. "Thatcham Research’s work with the SMMT and vehicle manufacturers, especially on new safety technologies, helps provide reassurance to consumers whilst providing the insurance industry with a way of validating the effectiveness of these new systems in reducing risks and thus insurance premiums."